Hearing loss affects an estimated 48 million Americans. There are many different causes, which translate to different types of hearing loss. An understanding of the cause and type of hearing loss is essential in developing a successful treatment plan. Conductive Hearing Loss. Conductive hearing loss occurs when there are problems with the ear canal, eardrum or middle ear. There are a variety of causes including structural deformities, fluid in the middle ear, ear infection, allergies, impacted earwax, perforated eardrum, foreign objects in the ear, otosclerosis and benign tumors. Conductive hearing loss may be correctable with surgery or medication. Sensorineural Hearing Loss. Sensorineural hearing loss involves problems with the inner ear and is sometimes referred to as “nerve deafness.” Causes include aging, noise exposure, trauma, viruses, autoimmune disorders, otosclerosis, Meniere’s disease, malformations of the inner ear and tumors. Treatment for sensorineural hearing loss usually requires hearing aids. Mixed Hearing Loss. This is a combination of conductive and sensorineural hearing loss and affects both the inner ear and middle or outer ear. Treatment options depend on the exact cause and may include a combination of medications, surgery and hearing aids. In addition to the different types of hearing loss, it is important to consider the extent to which a patient is experiencing symptoms. Hearing loss is further categorized as being either monaural or binaural. Unilateral hearing loss (sometimes referred to as single-sided deafness) affects one ear only, while bilateral hearing loss affects both ears. Patients with unilateral hearing loss have normal hearing in one ear and impaired hearing in the other; they have difficulty hearing on one side and localizing sound. This type of hearing loss is usually associated with conductive causes. 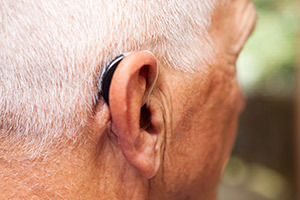 Individuals with bilateral hearing loss have impaired hearing in both ears. The condition is most often treated with hearing aids (two are more effective than one) or cochlear implants. The difference between a hearing exam and a hearing (audiology) evaluation is subtle: the exam refers to a single test that makes up part of the overall evaluation. There are many different types of hearing exams that may be administered.